The styling of this jacket falls a little outside my normal realm of vintage loveliness, but when I saw the tester call posted, I just couldn’t help myself. For one thing, I have been cleaning out my closets in a major way and I desperately needed a new mid-weight jacket to see me through the weirdness of autumn in Los Angeles. Also, I recently fell in love with Greenstyle’s patterns – I have been hoarding a few for a while, and finally made a couple of raglans, and I have some tights on my shortlist. I really love the fit, straightforward construction, and nice finishing details of her patterns. So I was very, very excited when I got chosen to be a tester. First, I made a muslin for fit using some scuba knit that I didn’t think I’d love all that much, but it turns out I do! I still haven’t finished that version- I just went far enough to make sure the fit was good. I’ll go back and finish it soon, because it’s just so bright and happy! If you’ve been curious, this is what most of pattern testing looks like – half-finished in-process garments that usually feel a lot better in person than they look in midnight selfies. To finish this one I still need to add the sleeves, thumbhole cuffs, zipper & zipper facing and final hem. 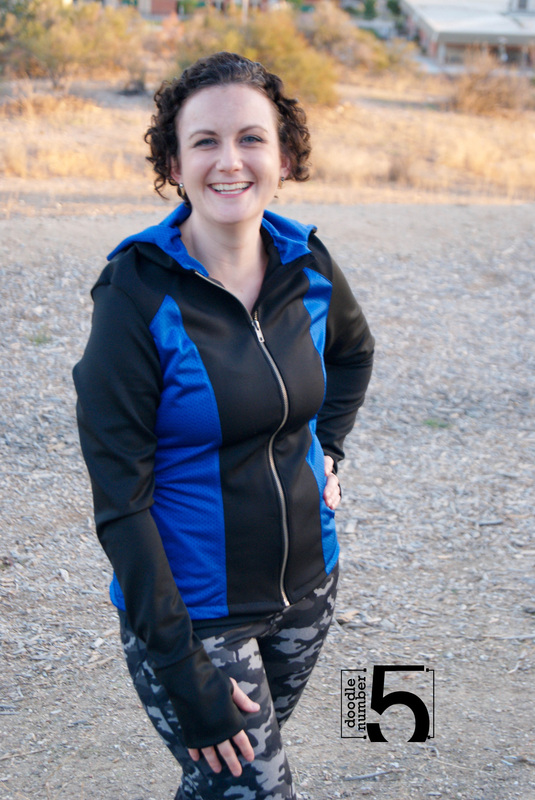 I made a second jacket identical to the first using black scuba and blue mesh – this one was meant to be my final “pretty” version. 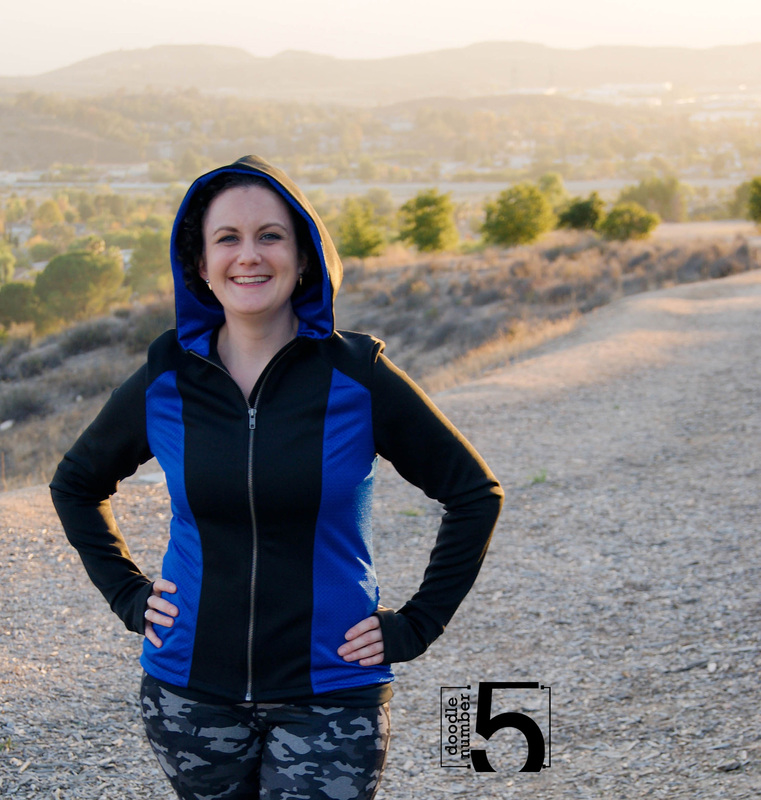 I’ve been wearing it daily – it is seriously the best dog-walking jacket I’ve ever worn. The scuba keeps me warm, the mesh lets the jacket breathe, the pockets are handy for pooper scooper baggies, and the thumbhole cuffs are just brilliant. Future pattern hack: use just the sleeve + thumbhole cuff to make an arm warmer perfect for typing in my frigid cubicle. 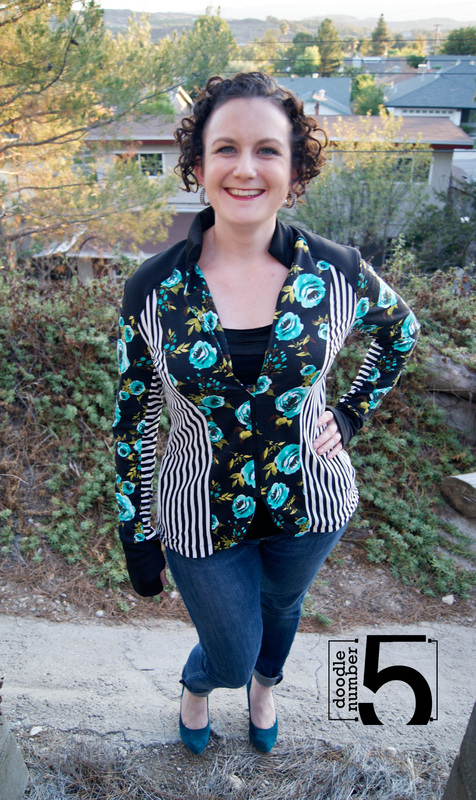 The pattern includes an awesome alternative thumbhole method that gives you enclose seams throughout without having to slipstitch or topstitch. It’s very similar to what is used for the Thumb’s Up Tee by OUSM that I tested a few months ago. It looks complicated, but Angelyn’s illustrations are very helpful and easy to understand. Seriously, how amazing is this jacket? The details for finishing are flawless and it looks better than retail. Though if you really wanted to buy it, you could find something very similar at Athleta in the $80-120 range. 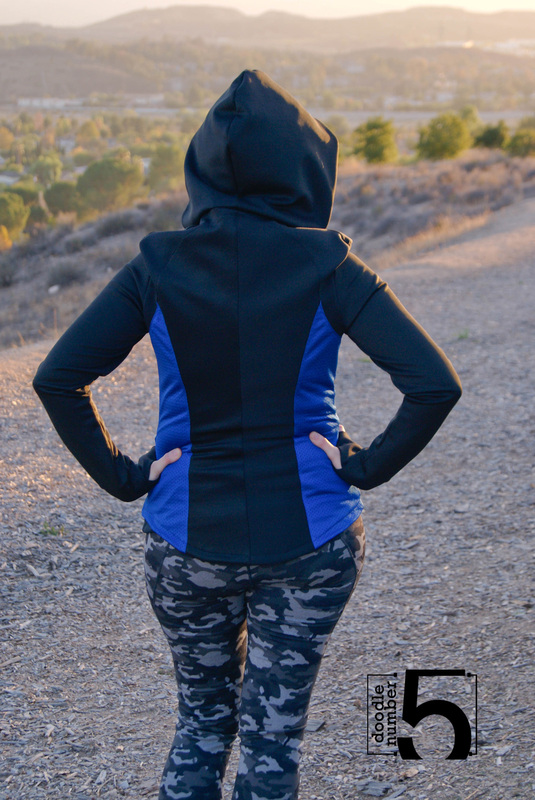 For this one, I made the plain back, thumbhole cuffs, hood, and zippered pockets with a metal separating zipper in the front. I did have to shorten the zipper using this technique to remove the teeth from the top of the zipper. For a quick minute, I thought I was done with this pattern – I made my muslin, made my final version and managed to get some cute pictures too (big, huge thanks to my friend Emma for stepping up to be my awesome photographer!) But one of the other testers made a gorgeous jacket using stripes and florals and I couldn’t get it out of my head. I just ordered a couple of amazing floral ponte de roma knits and I knew one of them would be perfect for this jacket. The side stripes are vertical for a couple of reasons – obviously one is to make me look skinny lol. The other is that it was almost impossible to match horizontal stripes front to back because of the curves along the side seam. To me, floral = feminine so I wanted to make the pleated back on this one. 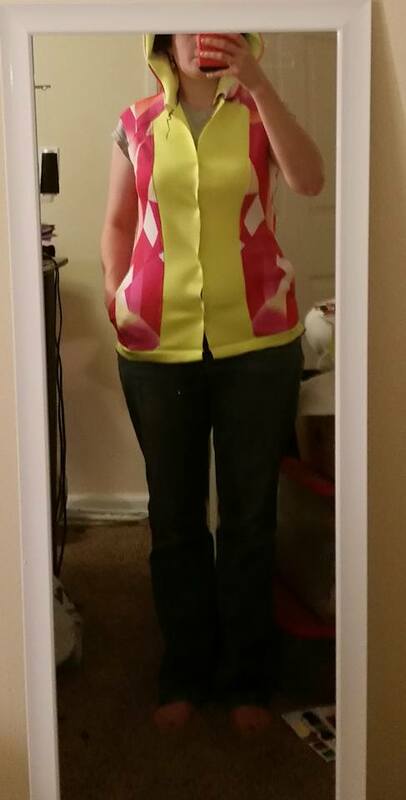 I also saw a picture of similar jacket that had a contrasting underarm panel, so I wanted to try that out. Finally, I figured while I’m hacking the pattern I’ll try shortening the front zipper (to 8 1/2″) to start just under my bust, curve the center front below the zipper, and since the floral is so pretty, I cut the back on the fold rather than piecing it to keep the print all together. That’s a lot of modifications, but none that are terribly complicated. I am totally in love with how it turned out. One more hack is planned- I’m going to try cutting the front panels on the fold, make a v-neck, and add a kangaroo pocket to the front. It will be a pullover hoodie rather than a zip-up jacket. We’ll see how that turns out. The moral of this story is that you should never just take a pattern at face value. This is a great athletic jacket pattern, and is perfect as written. A truly great pattern inspires you to think of a million ways to make it your own. Did you ever do the pullover hack? I LOVE athletic wear!! !